“Can we have a little privacy, please?” said your trash cans. Sure, in about 30 minutes, because that's all the time you'll need to put together this vinyl privacy accent fence (maybe less). It'll hide things like recycling bins and AC units. 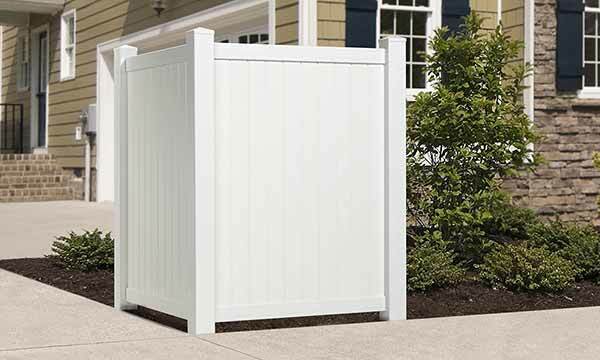 The corner accent fence kit includes 2 panels that form a stable L shape. All pieces slide together and lock in place. No posts to bury. It sits on top of concrete, or, you can secure it to the ground with the included stakes (they go inside the posts). Use this L-shaped fence to create a private corner on your patio or deck. Some people have used it to make an outdoor shower - it's pretty versatile.